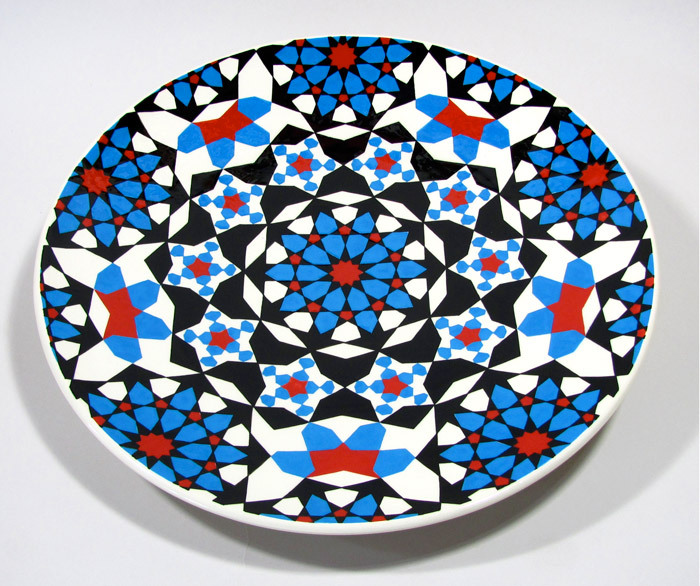 Platter by Paul Barchilon, the other chef in this family, whose main medium is ceramic! On a clean cutting board, grate ½ to a whole peeled cucumber (I prefer to use the thin English kind). Pour a large amount of salt over the pile of grated cucumber and mix with your fingers so the salt is coating the cucumber. The purpose of this is to bleed out the water. Let this mess sit and water will be pouring out of it. I usually place a clean dishcloth under my cutting board near the pile and wipe the water as the salt drains the cucumber of its liquid. Let the cucumber salt thing happen for at least 10 minutes if not longer. Meanwhile mix yogurt until it is smooth in the bowl you will be serving the raita in. In a tiny little pan heat a few teaspoons of olive oil, add 1/8–teaspoon. mustard seeds and the dried red chili. The mustard seeds are done when they have changed color and popped. Do NOT over cook these, one minute usually does it. Add this hot oil with the seeds into your yogurt. With clean hands, grab a bunch of the cucumber stuff and wring out as much liquid as you can over the sink, dump the cucumber into the yogurt bowl, repeat this process until you’ve gotten all the cucumber in the bowl. Add chopped tomato and cilantro. My husband does not like the seeds and occasionally I feel generous enough to leave some out for him that doesn’t have the seeds in it. I vastly prefer it with the seeds as the combination of the cold cucumber and yoghurt with the tiny pop and flavor of the mustard seed, just makes my mouth really happy. I hope you enjoy and make adaptations as your family or friends or self require, but I strongly urge you to remember the Ten Commandments of Nicole’s Kitchen, especially #1. Some folks also don’t like the tomatoes. Play with your food. You’ll find the right way to delight in this particular recipe. I serve this Raita with all Persian dishes I make, with all Indian food I am cooking or if I have lots of cucumbers around in the summer and just want another way to serve that up. It is refreshing, cooling and really delicious.